<?xml:namespace prefix = st1 ns = "urn:schemas-microsoft-com:office:smarttags" />China has attached great importance to the legislation of drug control. Ever since 1998, relevant drug control laws and regulation have been further developed. Specific regulations were designed and adopted such as the administration of narcotic drugs and psychotropic substances and the regulation on precursor control. In December 2007, the Drug Control Law of the People's Republic of China was enacted by the Standing Committee of the National People's Congress, which further clarifies drug control policy, leadership, functions and guarantee mechanism. It entered into force on 1 June, 2008. The Chinese Government takes the preventive education as an effective tool in addressing the root causes of illicit drugs, with all means to raise the awareness of the whole society, especially that of young people. By mobilizing the whole society in the course of drug control, the goal was to contain the trend of increase of new drug users. Compared with its peak, the annual growth rate of new heroin addicts has decreased to 4.6%, with the proportion of young abusers under the age of 35 falling to 51%. The rate of HIV patients infected through needle-sharing has fallen to 38.5%. The Chinese Government maintains that drug treatment and rehabilitation should proceed in a people-oriented way, and has applied various drug treatment measures including community-based, voluntary, compulsory in closed settings and community-based rehabilitation to help drug addicts. A total number of 70 integrated drug rehabilitation centers have been established guided by scientific evidence-based drug treatment practices and rules, which provide following-up help and services for opiate substance dependants after treatment for a smooth social reintegration. A number of 600 community-based maintenance treatment clinics were set up nationwide, providing maintenance treatment for opiate substance dependants. Faced with the serious drug trafficking situation, the China National Narcotics Control Commission coordinated efforts of relevant departments and established domestic interdiction and detection networks in major hotspot border areas along land, water and air routes as well as postal channels, which have greatly reduced the entry of illicit drugs. The Chinese Government has strengthened its efforts in combating drug-related crimes, organized and launched special operations in the areas with serious drug problem and in public recreation places. International and regional drug law enforcement cooperation has been strengthened by the Chinese law enforcement agencies, with a large number of clandestine laboratories, including drug manufacture and trafficking groups and networks dismantled, and a number of major drug cases jointly made with foreign counterparts, resulted in an effective curb on drug-related crimes. Since 1998, total of 956,000 drug-related criminal cases have been cracked, with a seizure of 73.2 tons of heroin, 78.5 tons of methamphetamine, 15.7 tons of opium and 9,162,000 tablets of ecstasy. In 2008, a specialized national narcotics control intelligence institution was established to improve the capacity of intelligence analysis. China has been improving anti-money laundering laws and regulations, and established specialized agencies dealing with money-laundering, cooperated with relevant international institutions and countries in dealing with drug trafficking related money laundering activities. The Chinese Government has persisted on strict administration of precursor chemicals. The State Council has formulated the Regulations on the Administration of Precursor Chemicals in 2005, reinforcing the administration procedures including production, trade, transportation, use, import and export of precursor chemicals. China has been in close cooperation with other countries and international institutions including the International Narcotics Control Board, with active participation in a series of international operations, including "Project Prism" and "Project Cohesion". Strict measures have been taken against the smuggling and illicit trading in precursor chemicals. Between 2005 and 2008, total of 6,340 tons of precursor chemicals were seized and attempts of illicit exporting of 5,053 tons of precursor chemicals were stopped through international checking mechanism. The Chinese Government has always attached great importance to drug control cooperation with the international community and relevant countries in respect of law enforcement, information exchange, combating crimes, alternative development and personnel training. In the Great Mekong Sub-region, China has devoted great efforts in alternative development by providing technical and financial assistance in the former opium cultivation areas of the northern parts of Myanmar and the Lao PDR with the aim of helping the local people in getting ride of poverty. During the past decade since the 20th UNGASS on Drug Control in 1998, the international community has adopted diversified drug control strategies in response to the varying features of the drug problem at different times. Governments in the world have intensified drug control efforts and strengthened international drug control cooperation, which has produced visible results in drug demand and supply reduction and other relevant fields. In particular, there has been a remarkable decrease in opium poppy cultivation in the "Golden Triangle" region in Southeast Asia for several consecutive years. The development evidences that regional drug problem could be effectively resolved through consistent and close international drug control cooperation. The international drug control course has well demonstrated the development of nations in acquiring better understanding of drug problem, improving effective international cooperation on drug control, and deploying more practical and diversified strategies and measures in addressing the drug issue. The Chinese delegation supports the new Political Declaration and the Action Plan to be adopted at this session. 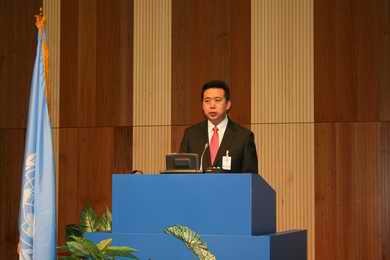 The Chinese government appreciates and supports the continuous efforts of the United Nations Office on Drugs and Crime and International Narcotics Control Board in the international drug control. In reviewing the achievements, we should not fail to see that the global scourge of drug problem is still spreading and the drug issue in some hotspot regions continues to pose a grave threat to the international community. The international drug control effort is facing new concerns and challenges, focusing on the problems of intensified types, illicit manufacturing, trafficking, and use of new illicit drugs, imbalance in measures between drug demand reduction and drug supply reduction, continued diversion of precursor chemicals into illicit channels, and lack of experience and funds for sustainable alternative development. The achievements made by the international community in drug control remain fragile with strong possibility of reverse. The drug control course is thus a course of long and arduousness. Under the present circumstance, mutually beneficial and win-win cooperation has become the common choice for nations in the world. Only through enhanced international cooperation, evidence-based guidance, institutional innovation and practical efforts, will we be able to mobilize the strength of the whole mankind and promote the international drug control endeavor up to a new level. First, strong determination and confidence on drug control by all sides should be ensured under the basic principles enshrined in the Charter of the United Nations and international laws. International drug control cooperation and coordination should be further enhanced in meeting the common challenges on the basis of mutual respect for each other's sovereignty and territorial integrity, equality, mutual benefit, non-interference into each other's internal affairs and respect for all human rights and basic freedoms. Second, the comprehensive and balanced approach should be pursued with shared responsibilities in drug demand and supply reduction. Third, it should be fully aware of the increasing connections between drug crime and other transnational organized crimes such as terrorism, money-laundering and corruption. Close and practical judicial assistance and law enforcement cooperation on criminal matters should be further enhanced on a broader basis, with improved drug control policies and strategies and domestic legal system. Fourth, necessary financial and technical assistance should be provided to developing countries in alternative development. On 26-27 February 2009, the Chinese Government held the conference marking the centennial of convening the International Opium Commission in Shanghai in 1909. High-level delegations from 17 countries participated in the event, including Austria, Cambodia, China, France, Germany, Iran, Italy, Japan, Lao PDR, Myanmar, the Netherlands, Portugal, Russian Federation, Thailand, United Kingdom, United States and Viet Nam, and United Nations Office on Drugs and Crime and International Narcotics Control Board. The conference reviewed the century-long international drug control efforts, shared respective drug control practices and measures, expressed opinions and recommendations on future international drug control. The conference adopted the Shanghai Declaration, by which reaffirmed the political commitment in pursuing a comprehensive, balanced and mutually reinforcing approach on the basis of shared responsibility, advocating the international community devoting more resources and international cooperation in solving the world drug problem. Following the resolution 51/8 of the 51st CND, Marking the centennial of the convening of the International Opium Commission, on behalf of the Chinese Government, I hereby present this session the results of the conference marking the centennial of the convening of the International Opium Commission and the Shanghai Declaration. In facing with the new challenges, the Chinese government will continue its efforts in fulfilling its political commitments. China will join in the international community in pursuit of the existing spirit of shared responsibilities and mutual trust, and contributing its shares to a harmonious and progressive society through coordinated efforts and scientific evidence-based comprehensive and balanced actions.